The ODNI's imagery sharing study must evaluate: (1) methods by which the United States could collect and provide imagery through commercial satellites, national technical means, or other intelligence, surveillance, and reconnaissance platforms under an information sharing arrangement; (2) the ability of other state parties to contribute to the arrangement; (3) statutory impediments or funding insufficiencies; (4) whether imagery of Moscow, Chechnya, the international border between Russia and Georgia, Kaliningrad, or the Republic of Belarus could be provided under such an arrangement; and (5) the costs of such an arrangement compared to the costs under the treaty for plane maintenance, aircraft fuel, crew expenses, mitigation measures necessary associated with Russian Federation overflights over the United States or other state parties, and new sensor development and acquisition. 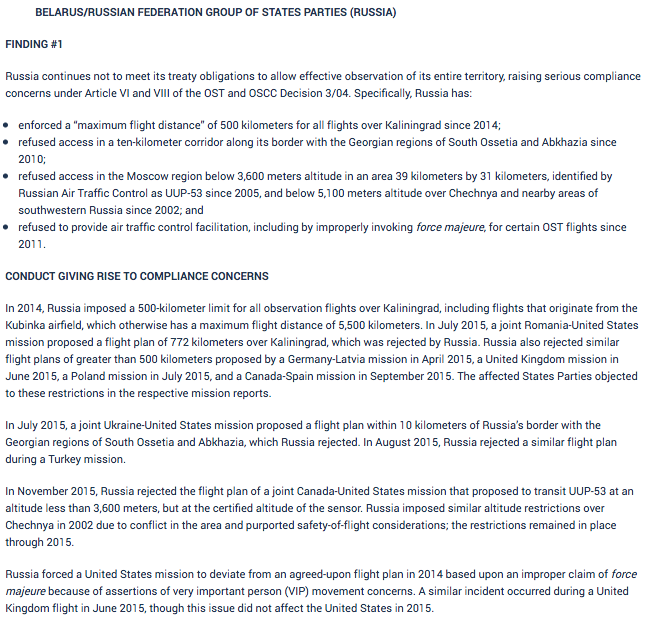 It is key to note that the ODNI will conduct a study to determine the feasibility of creating an intelligence sharing arrangement and database with aerial images of the territories of the nations signing the Treaty on Open Skies except for the Russian Federation and the Republic of Belarus. This is a very important development as you will see. "...enhance mutual understanding and confidence by giving all participants, regardless of size, a direct role in gathering information through aerial imaging on military forces and activities of concern to them. Open Skies is one of the most wide-ranging international arms control efforts to date to promote openness and transparency in military forces and activities.". Belarus, Belgium, Bosnia-Herzegovina, Bulgaria, Canada, Croatia, Czech Republic, Denmark, Estonia, Finland, France, Georgia, Germany, Greece, Hungary, Iceland, Italy, Latvia, Lithuania, Kyrgyzstan, Luxembourg, the Netherlands, Norway, Poland, Portugal, Romania, Russia, the Slovak Republic, Slovenia, Spain, Sweden, Turkey, Ukraine, the United Kingdom, and the United States. 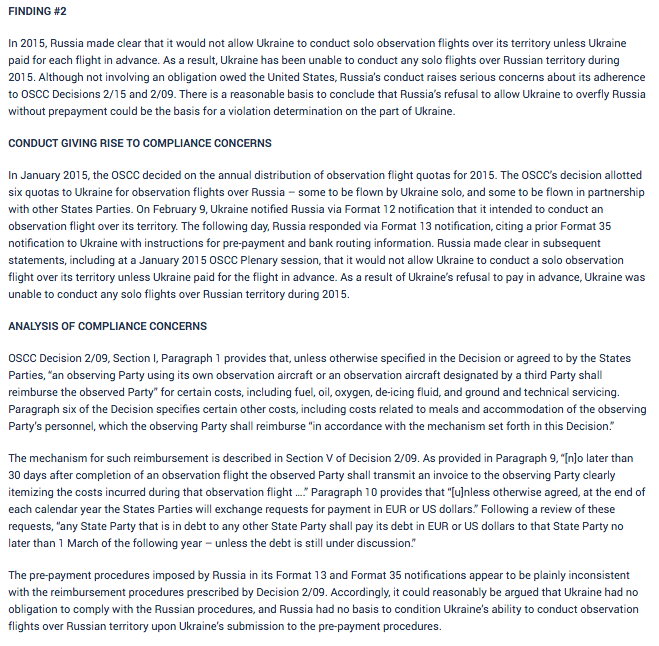 According to the Department of State, since 2002 when the Treaty entered into force, the United States has flown nearly three-times as many flights over Russia as the Russians have flown over the United States (196 vs. 71). 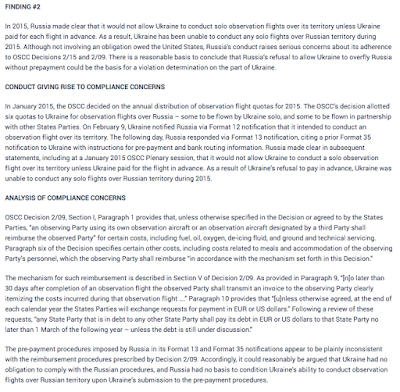 In addition, the United States can request copies of images taken by other member states over Russian territory; as such, there have been over 500 flights by over member states over Russian territory. For your information, the United States and Russian Federation are each allowed 42 flights as their passive quota annually along with as many flights as part of their annual active quota. "The United States flew over the arctic and far east regions of Russia in April 2016 and the most recent flight over Kaliningrad was by Poland in May 2016. Russia has placed certain altitude restrictions over Moscow; a distance limit of 500 kilometers over Kaliningrad, and refused overflights within 10 kilometers of part of its border with Georgia." With that, I would like to close the second part of this two part posting. With the original raison d'être for the Treaty on Open Skies being one of enhancement of mutual understanding and confidence between the signatories, the passing of H.R. 6393 would suggest that the Treaty is losing much of its clout. One thing we can be certain of, the war drums are beating and, at the very least, we are definitely seeing a return to the Cold War mentality of three decades ago. Unfortunately, as we've learned in past conflicts, those who lead us into war, remain alive, those who follow, get sent to the front lines as cannon fodder. This information should go viral, for it's crucial as a way the west is pushing a war against Russia. And the whole world should be aware of it. The war mongering neocons are gonna destroy this planet. And someone please explain what the elite's predictions are, because no one is gonna stay alive after it, not even them.